Evidence of environmental devastation looms in many places. 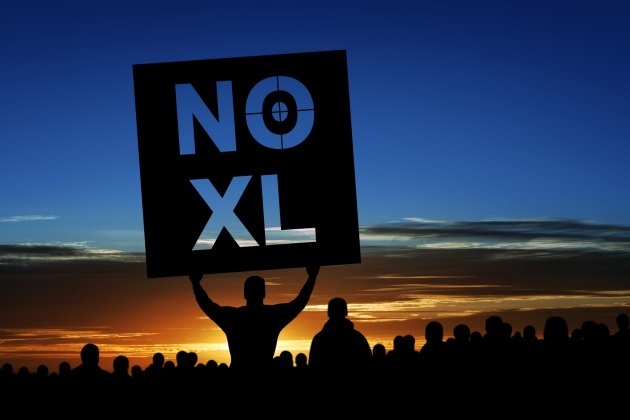 However, one development that recently went the other direction regards the controversial Keystone XL pipeline. This 1,200-mile pipeline was slated to bring oil from Alberta to the Gulf Coast by TransCanada Corp. It was designed to transport "about 800,000 barrels of petroleum a day," but it has been mired in environmental controversies since its inception. Environmental groups opposed the pipeline’s impact on biodiversity, air and water quality, and Native American groups opposed it. During the Obama administration, there were massive protests against it, with Obama ceasing pipeline building plans only to have Trump revive them right when he took office. The latest development saw U.S. District Court Judge Brian Morris of Montana rule against the pipeline, claiming that a full environmental impact review was not completed for the project, and that the issue of climate change was not fully considered. Morris reasoned that "the administration ran afoul of the Administrative Procedure Act, which requires ‘reasoned’ explanations for government decisions, particularly when they represent reversals of well-studied actions." While this is hailed as great news for those opposed to new pipeline projects, it does not mean that the pipeline is permanently halted. Instead, the judge’s ruling calls for a review that updates scientific data on the impact assessment. This ruling can also have an impact on the Dakota Access pipeline, another controversial project that has received much criticism. Another court case to keep your eye on is the lawsuit that children, ages 11 to 21, have launched against the federal government for inadequately preventing climate change. This lawsuit has seen a number of stops and starts as it meanders through the courts. Most recently, the Ninth Circuit Court of Appeals delayed the case from moving forward after the Supreme Court allowed it to proceed last week. Whether or not these kinds of lawsuits are the best way to halt climate change is debated. At minimum, they serve as educational tools and litmus tests for where the courts and public opinion are at when it comes to environmental protections. Meanwhile, Florida is a state’s positioned to be severely impacted by rising sea levels and destructive weather events as climate change develops. This is one reason why many are watching the developing story of the still-undecided U.S. Senate race in the state. Gov. Rick Scott’s bid against incumbent Democrat Bill Nelson is mired in voting recount controversies that promise to last weeks. Environmental conditions will continue to have a concrete, and in some cases life-altering, impact on all of us. The courts will play a critical role in the weeks and months ahead as election recounts can immediately impact environmental policies on the state level. In the latest news, groups are suing the Interior Department for ignoring scientific data when assessing the status of some endangered animals — including the beloved Pacific walrus. Stay tuned.